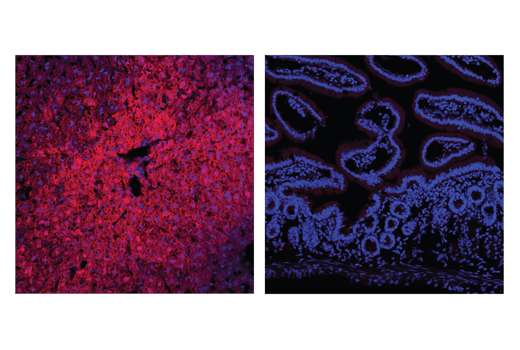 Confocal immunofluorescent analysis of mouse liver (positive; left) or small intestine (negative; right) using Arginase-1 (D4E3M™) Rabbit mAb (Alexa Fluor® 647 Conjugate) (red). Samples were mounted in ProLong® Gold Antifade Reagent with DAPI #8961 (blue). Confocal immunofluorescent analysis of mouse primary bone marrow-derived macrophages (BMDMs) using Arginase-1 (D4E3M™) XP® (Alexa Fluor® 488 Conjugate) Rabbit mAb (green). BMDMs were differentiated with M-CSF (20 ng/ml, 7 days) and activated with either IL-4/cAMP (20 ng/ml, 0.5 mM, 24 hours; left) or LPS/IFNγ (50 ng/ml, 20 ng/ml, 24 hours; right). Blue pseudocolor = DRAQ5® #4084 (fluorescent DNA dye). 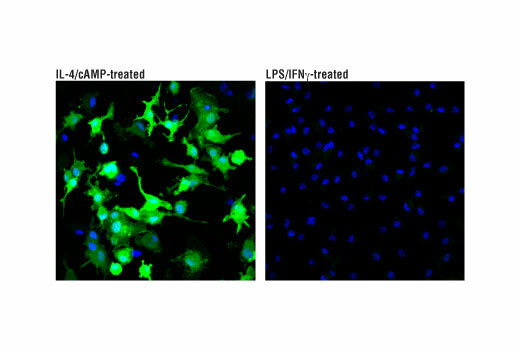 Arginase-1 (D4E3M™) XP® Rabbit mAb (Alexa Fluor® 488 Conjugate) recognizes endogenous levels of total arginase-1 protein. This antibody does not cross-react with arginase-2. This Cell Signaling Technology antibody is conjugated to Alexa Fluor® 488 fluorescent dye and tested in-house for direct flow cytometric analysis in human cells. This antibody is expected to exhibit the same species cross-reactivity as the unconjugated Arginase-1 (D4E3M™) XP® Rabbit mAb #93668. L-arginine plays a critical role in regulating the immune system (1-3). In inflammation, cancer and certain other pathological conditions, myeloid cell differentiation is inhibited leading to a heterogeneous population of immature myeloid cells, known as myeloid-derived suppressor cells (MDSCs). MDSCs are recruited to sites of cancer-associated inflammation and express high levels of arginase-1 (4). Arginase-1 catalyzes the final step of the urea cycle converting L-arginine to L-ornithine and urea (5). Thus MDSCs increase the catabolism of L-arginine resulting in L-arginine depletion in the inflammatory microenvironment of cancer (4,6). The reduced availability of L-arginine suppresses T-cell proliferation and function and thus contributes to tumor progression (4,6). Arginase-1 is of great interest to researchers looking for a therapeutic target to inhibit the function of MDSCs in the context of cancer immunotherapy (7). In addition, research studies have demonstrated that Arginase-1 distinguishes primary hepatocellular carcinoma (HCC) from metastatic tumors in the liver, indicating its value as a potential biomarker in the diagnosis of HCC (8,9). Albina, J.E. et al. (1989) J Exp Med 169, 1021-9. Mills, C.D. (2001) Crit Rev Immunol 21, 399-425. Rodriguez, P.C. et al. (2004) Cancer Res 64, 5839-49. Gabrilovich, D.I. and Nagaraj, S. (2009) Nat Rev Immunol 9, 162-74. Wu, G. and Morris, S.M. (1998) Biochem J 336 ( Pt 1), 1-17. Raber, P. et al. (2012) Immunol Invest 41, 614-34. Wesolowski, R. et al. (2013) J Immunother Cancer 1, 10. Sang, W. et al. (2015) Tumour Biol 36, 3881-6. Geramizadeh, B. and Seirfar, N. (2015) Hepat Mon 15, e30336.